What should we look out for during sessions and how do we record it? The things you see and hear during sessions will give you much richer information about what works and the difference you are making than if you rely on formal feedback alone. Record who is coming and also who is coming back. You need to know if people are staying involved or are trying it once or twice and then dropping out. Make sure everyone involved (staff and volunteers) knows what indicators you are looking for in relation to each of your outcomes. Your indicators are those things you should pay attention to which might tell you that change is happening. For example, if you have an outcome about increasing teenage girls’ confidence, indicators could include how they are dressed, their body language, whether they can start a conversation with new participants, how loudly they talk, what other activities they are involved in etc. Develop easy ways to record things. If it requires a lot of extra effort it won’t happen. Try adding some indicator prompts or space for short notes on your session register. You could use a simple spreadsheet or document to note down any feedback you happen to receive. 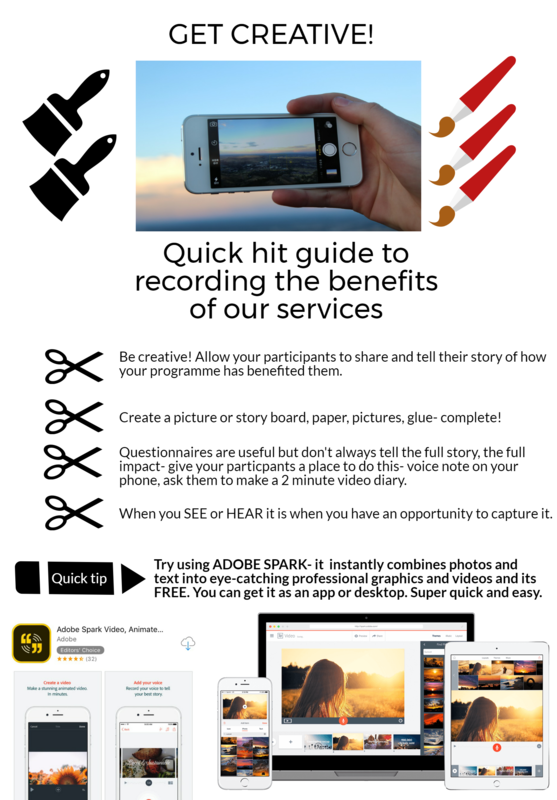 Capture people’s stories (even small ones) as you go – it’s hard to remember all the small changes over time. If there’s something bigger to say, you can turn some stories into case studies at a later date. Also record things that aren’t going so well. This will help you spot patterns and work out if you need to adjust your programme. Keep an eye out for evidence of unexpected outcomes as well. Take lots of photos and/or videos over time – with permission. If your programme uses social media, keep an eye on what people post before / during / after sessions. You could even ask them to post how they’re feeling. Take screen shots. This can provide invaluable evidence of the difference you’re making. Evaluation Support Scotland can help you identify appropriate indicators for your project. There are lots of free resources on their website: evaluationsupportscotland.org.uk. How can we stay responsive to people’s needs? What are we learning as we go?